TD Bank Ballpark Named "Best of the Ballparks"
(Bridgewater, N.J., June 27, 2016) - Steve Kalafer, Founding Chairman of the Somerset Patriots Baseball Club, has announced that the team’s home, TD Bank Ballpark, has been named Ballpark Digest’s Best Independent Ballpark in the nation for the second straight year. This is the second year for the Best of the Ballparks fan voting, where Ballpark Digest asked its readers to weigh in on their favorite MLB, Triple-A, Double-A, High-A, Low-A, Short Season A, Independent, Summer-Collegiate, and Spring Training ballparks. TD Bank Ballpark was the only one to repeat as fan favorite in 2016, underscoring how difficult it is to win back-to-back championships. 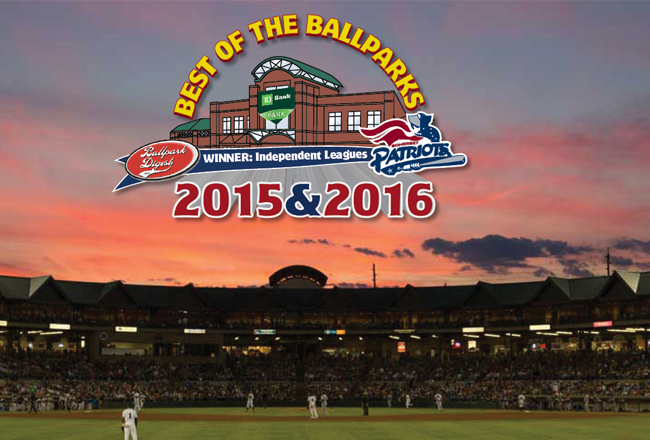 Over 94,000 fans have voted so far in the Best of the Ballparks 2016 competition. In the final round, fans were asked to choose between TD Bank Ballpark and Regency Furniture Stadium, home of the Southern Maryland Blue Crabs, in an all-Atlantic League conclusion to voting. The final round saw 4,855 votes cast: 3,481 for TD Bank Ballpark (72%) and 1,374 for Regency Furniture Stadium (28%). “We are humbled and appreciative of all those that took the time to vote to show their love for our home. The numbers speak for themselves of how much people care about TD Bank Ballpark. It was the vision of our ownership; and the Somerset County Board of Chosen Freeholders to build the ballpark in Bridgewater Township. Their vision is made a reality everyday by the families, businesses and organizations that have made TD Bank Ballpark the premier community gathering place in Central New Jersey,” added Somerset Patriots President/General Manager Patrick McVerry. After receiving a first round bye for winning in 2015, TD Bank Ballpark bested Kokernot Field (Alpine Cowboys) in the second round with 77%, topped Yogi Berra Stadium (New Jersey Jackals) in round three with 67%, and won the fourth round over Community America Ballpark (Kansas City T-Bones) with 72%. TD Bank Ballpark then took on Atlantic League ballparks in the last two rounds, defeating Constellation Field (Sugar Land Skeeters) in the Final Four with 64% to advance to the Final Round against the Regency Furniture Stadium (Southern Maryland Blue Crabs). TD Bank Ballpark, the home of the Somerset Patriots since opening in June of 1999, battled through the Best of the Ballparks contest in 2015, eventually besting CHS Field, the $64 million home of the St. Paul Saints in Minnesota, in the final round by a margin of 65% to 35%. TD Bank Ballpark, the “Jewel of the Atlantic League,” officially opened its gates in June of 1999 and has welcomed over 6,000,000 fans. The 6,100-seat ballpark is owned by Somerset County and managed by the Somerset Patriots, who have consistently drawn over 5,300 fans per game and 370,000 fans per season since 1999. “This award reaffirms what Somerset County and Central New Jersey residents know, that our beautiful TD Bank Ballpark is the best. Our ballpark has provided families and the community with a safe and clean place to enjoy America’s favorite pastime for almost two decades now. I can tell you that this is a well-deserved honor and we are all very proud to say TD Bank Ballpark is one of the jewels that makes Somerset County such a great place to live, work and visit,” said Patricia Walsh, Somerset County Freeholder Director. The 2016 Somerset Patriots Season Presented By Ford is underway. For more information or to purchase tickets for the 2016 season, stop by TD Bank Ballpark, call (908) 252-0700, or visit www.somersetpatriots.com.